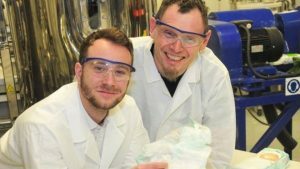 Scientist-founded startup develops process to recycle nappies, incontinence pads and sanitary products. Aberystwyth University Scientist Joe Freemantle said this waste stream can be separated and refined to produce biofuel and textiles, including rayon and viscose, which are often used to make clothing. Biofuels are fuels produced from plant material or waste and in 2012 the EU changed its policy on biofuels, encouraging production from waste materials rather than from food crops so as not to compete with the food supply needs of the developing world. Every year the UK produces around one million tonnes of this hygiene product waste and Joe’s research work has been funded by the Climate-KIC Greenhouse programme, following a successful bid in December 2015. “I have always had a passion for sustainability, climate change and business and my aim here is to bring all three together in a positive move,” Mr Freemantle said. The research has led to him establishing his company Green Phoenix and the project to convert used nappies and sanitary waste.